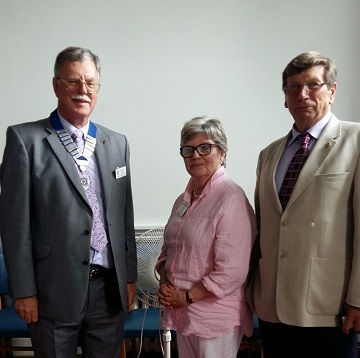 The first task and a pleasant one for new President Malcolm Webb was to welcome Rotarian Liz Cullen from the RC of Newburyport Massachusetts. A joint photo of three PDGs was too good to miss. Malcolm Webb PDG 1070 (98–99), Liz Cullen PDG 7930 (07–08) and Peter Manton PDG 1070 (09–10).